You know how in the previous post I said that I often procrastinate present giving. 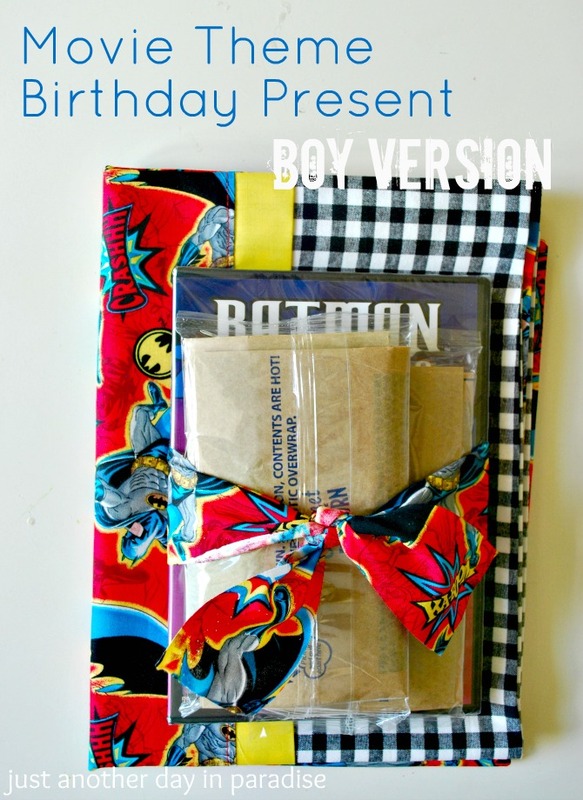 This boy version of the Movie Theme Present is case in point. Mere days after rushing to get the girl version done for a party, I could be found sitting at my machine putting together a boy version for a party which was the next day. Now, in my defense, I was already planning to do this present. PLUS I thought the party was at the end of the week. Good thing Hubby read the invite to me the night before otherwise we may have unintentionally missed the party. Okay, so here is the boy version of my Movie Theme Present. Just add popcorn, instant present. Get a really awesome boy-approved bag. Now the Movie Theme present is ready for our little friend. Great gift ideas. I love the pillow case matching the movie. Very unique.